One of the most famous and historical hotels in Yellowstone, the Old Faithful Inn is nothing short of an architectural masterpiece. With 6 lodges Grant Village sits on the shore of Yellowstone Lake. The beautiful and serene West Thumb Geyser Basin is a 2 mile drive up the road and is a must-see. The natural look of the log cabin style Lake Lodge inspires a real western feeling. The Lake Lodge plays host to over 100 cabins in this back region of the Lake Area. The majestic Lake Hotel sets right on the banks of Yellowstone Lake, overlooking mountains and blue water as far as the eye can see. Roosevelt Lodge is a small quiet area consisting of 85 rustic cabins in one of the most beautiful and scenic regions of Yellowstone. Quick Tip: Lodging inside the park begins filling up well before the season starts. Try to make your reservations as far in advance as you can to help your chances for getting the location that you want. If you can not get reservations at the hotel or cabin that you want, check back frequently with the park's concessionaire (307-344-7311) to see if there were any cancelations. Quick Tip: These hotels are located in a small town called West Yellowstone, Montana which is located along the west boundary of Yellowstone National Park and less than 1 mile from the park's west entrance. Staying here for part or all of your vacation would provide you with a pretty decent jumping off point for getting anywhere in the park. Rooms fill up fast so go to Expedia.com and quickly and easily reserve your hotel in West Yellowstone, MT. Helpful Tip: When choosing your lodging accommodations, there is one important thing to consider when making your decision...location. It really helps reduce the amount of time you will have to drive, if you choose a hotel in the region of the park you will be spending your time. For example, for the first 2 days of you vacation you will be exploring the northern region of Yellowstone, so you choose to stay in the park at the Mammoth Hot Springs Hotel, Roosevelt Lodge or outside the park's North Entrance in the gateway town of Gardiner, Montana. For the last 2 days of your vacation, you wish to explore the southern region of the park, so you move to a hotel in Old Faithful village or the Yellowstone Lake Region to be closer to the attractions in the southern region of Yellowstone. There are a couple of centrally located accommodations that could serve as 'home base' for your entire vacation, rather than moving to different hotels. 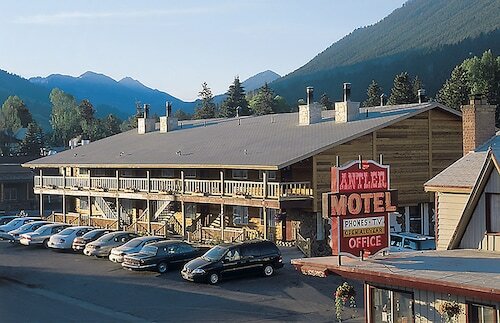 Inside the park, the most centrally located accommodations would be at Canyon Lodge, located in Canyon Village. The most centrally located accommodations outside of the park would be in the gateway town of West Yellowstone, Montanawhich is less than one mile from Yellowstone's West Entrance. Don't be discouraged if you can only find rooms available at one end of the park, but you still want to explore the attractions at the opposite side of the park as well. It is still possible to drive from your hotel at one end of the park to see sights at the other end of the park in a single day. Quick Tip: These hotels are located in a small town called Gardiner, Montana which is located at the north entrance of Yellowstone National Park and less than 1 mile from the north entrance station. This would be a good location to stay while you are exploring the northern region of Yellowstone. Rooms fill up fast so go to Expedia.com and quickly and easily reserve your hotel in Gardiner, MT. Quick Tip: Commuting from your hotel in Yellowstone for a day trip to Grand Teton National Park, could add hours of driving time to your day. Consider staying overnight at one of these hotels in Jackson hole, Wyoming which is only about 5 miles from the Tetons. Rooms fill up fast so go to Expedia.com and quickly and easily reserve your hotel in Jackson Hole, WY.